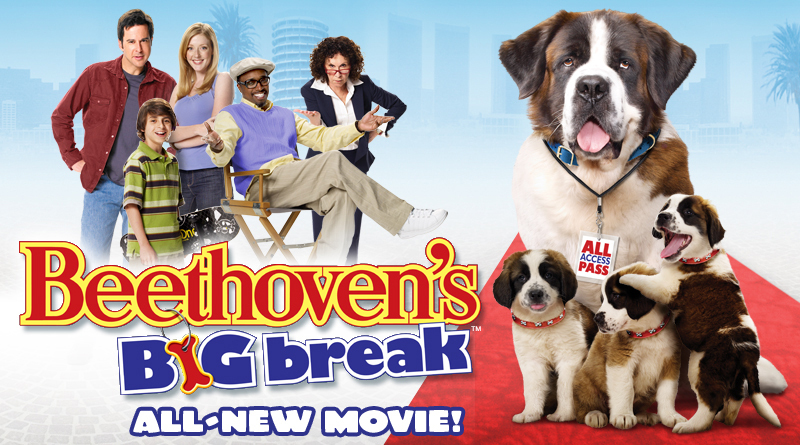 Fall in love with the big-hearted, slobbering 185-pound St. Bernard, Beethoven, in this howl-arious adventure that features an all-star cast, including Jonathan Silverman (Weekend At Bernies), Rhea Perlman (Cheers), Moises Arias (Hannah Montana), Stephen Tobolowsky (Heroes), Oscar Nuñez (The Office), Cesar Millan (The Dog Whisperer), Joey Fatone ('N Sync) and Eddie Griffin (Undercover Brother). Although animal handler Eddie (Silverman) works with lots of creatures, he has a strict NO PETS ALLOWED policy and won’t let his son Billy keep adorable stray dog Beethoven and his family of puppies. But when dog-nappers steal the canine star of the movie Eddie’s working on, the studio big shots must quickly find a replacement and unexpectedly cast the lumbering canine as their next big star. Through his rambunctious antics and larger-than-life personality, Beethoven not only crashes into Hollywood but into Eddie’s heart as well. PG - for some mild rude humor.